Similar jars from tombs datable to AD 287 and 298, respectively, have been excavated in Zhejiang province. 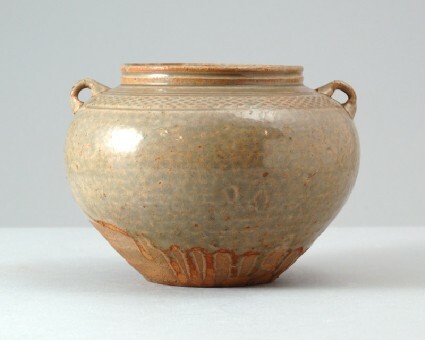 The rounded jar has a concave base and a short neck with horizontal grooves. Two vertical lugs are applied on the shoulder, over a rouletted diaper border. The light yellowish-green glaze is somewhat mottled and stops in the lower third of the sides. It leaves the inside and underside free, but ran down to the base in several thin strands, now degraded. The biscuit has fired a reddish tone.